The next Autism Friendly session at Thinktank will be on Saturday 21 October. Birmingham Museums’ ‘Morning Explorers’ sessions are designed for families with children on the autistic spectrum or with other special needs, to get access to Birmingham’s museums. The entry charge is reduced and there are free craft activities, reduced numbers and noise, and a great chance for the whole family to enjoy our museums in a relaxed setting. Please see the attached flyer with more information, including how to book. 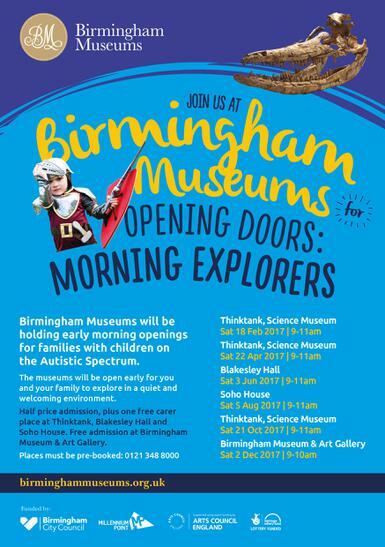 You can also find details at http://www.birminghammuseums.org.uk/thinktank/whats-on/morning-explorers-4b234bd6-92ee-4289-8a19-a1218e646659 or on Twitter @BMTEngage.